An absorbent binder composition is provided which is capable of crosslinking after application to a substrate, in the absence of radiation, at a temperature of about 120° C. or less. The absorbent binder composition includes about 15 to about 99.8% by mass monoethylenically unsaturated polymer units, about 0.1 to about 20% by mass polyacrylate ester units having an alkoxysilane functionality, and about 0.1 to about 75% by mass of polymer units selected from polyolefin glycols and polyolefin oxides. The absorbent binder composition can be prepared using a template polymerization process, with the preformed polyolefin glycol or polyolefin oxide serving as a template polymer. This application is a continuation-in-part of U.S. patent application Ser. No. 10/206,883, filed on Jul. 26, 2002, the disclosure of which is incorporated by reference. This application is also a continuation-in-part of U.S. patent application Ser. No. 10/324,478, filed Dec. 20, 2002, the disclosure of which is incorporated by reference. “High density polyethylene (HDPE)” refers to a polyethylene having a density of about 0.95 g/cm 3 or greater. “Linear low density polyethylene (LLDPE)” refers to polymers of ethylene and higher alpha-olefin comonomers such as C 3-C12 comonomers, and combinations thereof, having a density of about 0.900 to about 0.935 g/cm3. “Low density polyethylene (LDPE)” refers to a polyethylene having a density between about 0.91 and about 0.925 g/cm 3.
wherein R 1, R2 and R3 are alkyl groups independently having from 1 to 6 carbon atoms. One advantage of the absorbent binder composition of the invention is that it provides a water-soluble ionic polymer capable of sufficient spontaneous crosslinking within about 10 minutes, at a temperature of about 120° C. or less, to reach an absorbent capacity of at least one gram of fluid per gram of absorbent binder composition, suitably at least three grams of fluid per gram of absorbent binder composition, using the centrifuge retention capacity test described herein. The term “spontaneous” crosslinking refers to crosslinking which occurs without radiation, catalysis, or any other inducement other than the specified temperature of about 120° C. or less, suitably about 100° C. or less. Eliminating the need for radiative crosslinking provides a significant processing advantage. The crosslinking at temperatures of about 120° C. or less, suitably about 100° C. or less, permits the absorbent binder composition to be applied to a substrate such as an absorbent article, and then crosslinked without degrading or damaging the substrate. The crosslinking occurs within about 10 minutes, suitably within about 8 minutes, particularly within about 6 minutes provides an efficient, commercially feasible, cost-effective crosslinking process. The ionic polymer may bear a positive charge, a negative charge, or a combination of both, and should have an ionic unit content of about 15 mole percent or greater. The ionic polymer may include a variety of monomer units described above, and suitably contains a carboxyl group-containing unit or a quaternary ammonium-containing unit. Two monomer solutions were prepared separately. Solution No. 1 was prepared as follows. To 14.4 grams (0.20 moles) of acrylic acid in a 200 ml beaker was added 33.3 grams of a 18% aqueous solution of polyethylene glycol 8000, followed by a solution of 3.2 grams of sodium hydroxide in 21.4 grams of distilled water. Then, 0.18 grams (1.02×10 −3 moles) of ascorbic acid was added to the solution. This mixture was stirred with a magnetic stir bar at about 60 rpm in a bath of water at about 23° C. until the ascorbic acid was dissolved and the mixture cooled to 23° C.
Solution No. 2 was prepared in the following manner. To 14.4 grams (0.20 moles) of acrylic acid, in a 300 ml beaker was added to 33.3 grams of a 18% aqueous solution of polyethylene glycol 8000 (mol. wt.=8000) followed by a solution of 3.2 grams of sodium hydroxide in 21.4 grams of distilled water, 0.57 ml of 30% aqueous hydrogen peroxide and 1.0 ml (5.42×10 −3moles) of 3-(trimethoxysilyl)propyl methacrylate. The ingredients were added with stirring to produce a clear solution. This mixture was stirred with a magnetic stir bar at about 60 rpm in a bath of water at about 23° C. to provide a clear solution cooled to 23° C.
Solution No. 2 was added to Solution No. 1 while stirring with a magnetic stir bar at about 60 rpm. A thermocouple was used to monitor the temperature and observe the reaction exotherm. The polymerization reaction began within about 30 seconds of mixing as the temperature rose from 23° C. to 40° C. A maximum temperature of about 70° C. was observed after three minutes of mixing the two solutions. The polymerization transformed the combined solutions into a soft gel. The gel was cut into pieces of about 1 cm 3 and added to the solution of 8 grams (0.20 moles) sodium hydroxide in 160 grams of distilled water. With continued stirring, aided by an Ultraturax homogenizer at 11,000 rpm, the soft gel became a viscous translucent solution. The resulting aqueous binder composition was cast into a film by pouring 25.1 grams of solution into a polystyrene weigh boat, available from VWR International, catalog no. 12577-027, with surface area of about 80 cm 2, and allowing the water to evaporate overnight in a hood at room temperature. The resulting film weighed 4.62 grams, indicating a solution concentration of about 18.4%. An aqueous binder composition was prepared according to the procedure of EXAMPLE 1. This example was used to determine the speed of crosslinking in the following manner. Six 10-cm by 10-cm pieces of loft bonded carded web surge material made according to U.S. Pat. No. 5,364,382, by Kimberly-Clark Corporation, with a basis weight of about 45 gsm and a density of 0.04 g/cm 3 measured at a pressure of 0.05 psi, were each immersed in about 12 grams of the binder solution to thoroughly saturate the fabric. The dry weight of each fabric was weighed prior to saturation with the binder solution. The weights of the starting solution and of the residual solution were measured, with the difference being equal to the weight of solution applied to each piece of fabric. The saturated surge sample was placed on an aluminum screen and dried for times ranging from 5 to 15 minutes at 105° C. in a Mathis through-air-dryer oven, available from Werner Mathis in Palmer, Pa. After drying, for the specified time, listed in Table 1, the coated fabric was weighed. After removal from the through-air-dryer oven the absorbent capacity of each of the test fabrics was determined using the Centrifuge Retention Test. The samples were then dried for 3 hours at 80° C. in a Constant Temperature Oven, Model DK-63, available from Scientific Products. The re-dried weight was used to determine the fraction of the binder solution that was extractable. For instance, 100% extractable would be indicative of a fully soluble polymer with no crosslinking and no absorbent capacity. The extent of crosslinking is inversely proportional to the percent of extractable components. This example relates to the preparation of a cationic absorbent polymer. Two monomer solutions were prepared separately. Solution No. 1 was prepared as follows. To 55.0 grams of a 75% solution of (3-acrylamidopropyl) trimethyl ammonium chloride (0.20 moles) was added 21.3 grams of deionized water, and 6.0 grams of PEG 200 (molecular weight 200). Then, 0.18 grams (1.02×10 −3 moles) of ascorbic acid was added to the solution. This mixture was stirred with a magnetic stir bar at about 60 rpm in a bath of the water at about 23° C. until the ascorbic acid was dissolved and the mixture cooled to 23° C.
Solution No. 2 was prepared in the following manner. To 55.0 grams of a 75% solution of (3-acrylamidopropyl) trimethyl ammonium chloride (0.20 moles) was added 21.3 grams of deionized water, 6.0 grams of PEG 200 (molecular weight 200), 0.37 ml of 30% aqueous hydrogen peroxide and 1.0 ml (5.42×10 −3 moles) of 3-(trimethoxysilyl)propyl methacrylate. This mixture was stirred with a magnetic stir bar at about 60 rpm in a bath of water at about 23° C. to provide a clear solution cooled to 23° C.
To 50 grams of the 33% polymer solution was added 2.5 ml of a 0.2% solution of hydrochloric acid. This solution was poured into two weighing dishes (about 24 grams into each dish with 80 cm 2 area) and the solution was dried for two days in the laboratory hood. The resultant film was very soft and flexible and slightly tacky. The absorbent capacity of the film was tested using the Centrifuge Retention Capacity test described below. The film had an absorbent capacity of 15.3 grams/gram. 1. An absorbent binder composition comprising a water-soluble ionic polymer capable of sufficient non-radiative crosslinking within about 10 minutes at a temperature of about 120° C. or less, to reach an absorbent capacity of at least one gram per gram using the centrifuge retention capacity test. 2. The absorbent binder composition of claim 1, comprising about 15 to about 99.8% by mass monoethylenically unsaturated polymer units, about 0.1 to about 20% by mass ester units selected from the group consisting of acrylate and methacrylate ester units that include an alkoxysilane functionality, and about 0.1 to about 75% by mass of units selected from the group consisting of polyolefin glycol and polyolefin oxide units. 3. The absorbent binder composition of claim 1, comprising about 25 to about 89.5% by mass monoethylenically unsaturated polymer units, about 0.5 to about 15% by mass ester units selected from the group consisting of acrylate and methacrylate ester units that include an alkoxysilane functionality, and about 10 to about 60% by mass of units selected from the group consisting of polyolefin glycol and polyolefin oxide units. 4. The absorbent binder composition of claim 1, comprising about 30 to about 79% by mass monoethylenically unsaturated polymer units, about 1.0 to about 10% by mass ester units selected from the group consisting of acrylate and methacrylate ester units that include an alkoxysilane functionality, and about 20 to about 50% by mass of units selected from the group consisting of polyolefin glycol and polyolefin oxide units. 5. The absorbent binder composition of claim 1, wherein the water-soluble ionic polymer comprises at least about 15 mole percent ionic polymer units. 6. The absorbent binder composition of claim 1, wherein the ionic polymer has a negative charge. 7. The absorbent binder composition of claim 6, wherein the ionic polymer comprises a carboxyl group-containing monomer. 8. The absorbent binder composition of claim 1, wherein the ionic polymer has a positive charge. 9. The absorbent binder composition of claim 1, wherein the ionic polymer is capable of sufficient non-radiative crosslinking within about 10 minutes at a temperature of about 120° C. or less, to reach an absorbent capacity of at least 3 grams per gram using the centrifuge retention capacity test. 10. The absorbent binder composition of claim 8, wherein the ionic polymer comprises a quaternary ammonium group-containing monomer. 11. The absorbent binder composition of claim 8, wherein the ionic polymer comprises a reaction product of 1) a monomer selected from the group consisting of acryloyloxyethyl-trialkyl-substituted ammonium salts, acryloyloxypropyl-trialkyl-substituted ammonium salts, acrylamidoethyl-trialkyl-substituted ammonium salts, and acrylamidopropyl-trialkyl-substituted ammonium salts, with 2) a monomer selected from the group consisting of methacryl esters which contain an alkoxysilane group and acryl esters which contain an alkoxysilane group. c. about 0.1 to about 75% by mass polymer units selected from the group consisting of polyolefin glycol units, polyolefin oxide units, and combinations thereof. 13. The absorbent binder composition of claim 12, wherein the monoethylenically unsaturated polymer units and the polyacrylate ester units including an alkoxysilane functionality are copolymerized. 14. The absorbent binder composition of claim 12, wherein at least some of the polymer units selected from the group consisting of polyolefin glycol units, polyolefin oxide units, and combinations thereof are copolymerized with at least some of the polyacrylate ester units. 15. The absorbent binder composition of claim 12, wherein the monoethylenically unsaturated polymer units comprise units selected from the group consisting of carboxyl group-containing units, carboxylic acid anhydride group-containing units, carboxylic acid salt group-containing units, and combinations thereof. 16. The absorbent binder composition of claim 12, wherein the monoethylenically unsaturated polymer units comprise units selected from the group consisting of sulfonic acid group-containing units, sulfonic acid salt group-containing units, and combinations thereof. 17. The absorbent binder composition of claim 12, wherein the monoethylenically unsaturated polymer units comprise amide group-containing units. 18. The absorbent binder composition of claim 12, wherein the polyacrylate ester units comprise acrylate ester units including the alkoxysilane functionality. 19. The absorbent binder composition of claim 12, wherein the polyacrylate ester units comprise methacrylate ester units including the alkoxysilane functionality. 21. The absorbent binder composition of claim 12, wherein component c) comprises a polyolefin glycol including an olefin having about 2 to about 4 carbon atoms. 22. The absorbent binder composition of claim 21, wherein the polyolefin glycol has a weight average molecular weight of about 200 to about 8000. 23. The absorbent binder composition of claim 21, wherein the polyolefin glycol is selected from the group consisting of polyethylene glycol, polypropylene glycol and combinations thereof. 24. The absorbent binder composition of claim 21, wherein component c) comprises a polyolefin oxide including an olefin having about 2 to about 12 carbon atoms. 25. The absorbent binder composition of claim 24, wherein the polyolefin oxide has a weight average molecular weight of about 100,000 to about 600,000. 26. The absorbent binder composition of claim 24, wherein the polyolefin oxide is selected from the group consisting of polyethylene oxide, polypropylene oxide, and combinations thereof. copolymerizing the first and second monomers using the first polymer as a template, to form the absorbent binder composition..
28. The method of claim 27, further comprising the steps of adding the first polymer into a first liquid medium, adding the first monomer into the first liquid medium, adding the second monomer into a second liquid medium, and combining the first liquid medium with the second liquid medium. 29. The method of claim 27, further comprising the steps of adding the first polymer into a first liquid medium, adding the first monomer into a second liquid medium, adding the second monomer into the first liquid medium, and combining the first medium with the second liquid medium. 30. The method of claim 27, further comprising the steps of adding the first polymer into a first liquid medium and a second liquid medium, adding the first monomer into the first liquid medium, adding the second monomer into the second liquid medium, and combining the first liquid medium with the second liquid medium. 31. The method of claim 28, further comprising the steps of adding a reducing polymerization initiator to one of the first and second liquid media, and adding an oxidizing polymerization initiator to the other of the first and second liquid media. 32. The method of claim 29, further comprising the steps of adding a reducing polymerization initiator to one of the first and second liquid media, and adding an oxidizing polymerization initiator to the other of the first and second liquid media. 33. The method of claim 30, further comprising the steps of adding a reducing polymerization initiator to one of the first and second liquid media, and adding an oxidizing polymerization initiator to the other of the first and second liquid media. 34. The method of claim 30, further comprising the step of crosslinking the absorbent binder composition in the absence of radiation, at a temperature of about 120° C. or less. 35. An absorbent article comprising the absorbent binder composition of claim 1. 36. An absorbent article comprising the absorbent binder composition of claim 12. 37. An absorbent article comprising an absorbent binder composition prepared according to the method of claim 27. MXPA05000433A MXPA05000433A (en) 2002-07-26 2003-07-18 Absorbent binder composition, method of making it, and articles incorporating it. 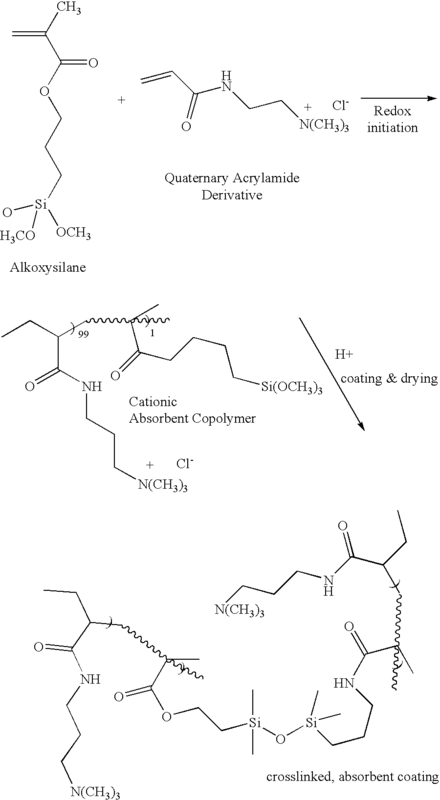 ARP030102691 AR040703A1 (en) 2002-07-26 2003-07-25 An absorbent binder composition, an article and a combination of coating and substrate that comprise absorbent products with such combination and method of making. FI85590C (en) 1992-05-11 Hydrogelbildande polymerkompositioner Foer anvaendning i absorbing Produkter, foerfarande Foer deras framstaellning Science industry innehaollande produkter.